Tim Gee writes about oil in Ecuador and the activists who could save the future of the national park. Birds fly by - a kingfisher, a heron, an osprey, parrots. In the trees there are three hoatzins: a bird from prehistoric times. The trees are wider than the open arms of a human being. The butterflies are bigger than my hand. The bees are as big as dollar coins. 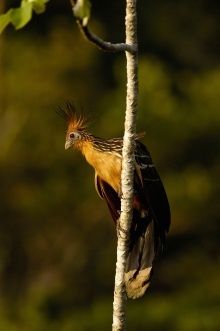 This is Yasuní, Ecuador, one of the most biodiverse places in the world. Here there are animals we see in picture books or zoos - pumas, jaguars, sloths. But on the river there are new kinds of animals - boats full of petroleros (oil engineers). Sometimes bigger animals pass by - oil trucks on boats. We see the word - PELIGRO! – DANGER! - on their sides. In 2007 President Rafael Correa of Ecuador told the UN General Assembly about his government’s idea. They would not drill in the Yasuní oilfield, if the international community gave money for some of the lost oil. Only a little of the money was given. But on 15 August 2013 the President said it was time to drill the oil. How was the dream lost? We need to look at the story of the movement. The story begins up the river in the place where the oil-towns of Coca and Nueva Loja now stand. This was always rich rainforest, where communities lived and hunted. Today, there are oil wells, oil trucks and more DANGER! signs. The towns are full of dirty, polluted streets, poverty and imported workers in Halliburton oil company uniforms. This is a warning of a possible future. But there are people with a different view of the world in the future. In Nueva Loja I met Donald Moncayo. He is one of the most active members of the Union of People Affected by Texaco. With protective gloves in one hand, and a small earth sampler in the other, he showed me around his small family farm. He didn’t need to dig very deep before the air was full of the smell of petrol. There was thick, sticky oil which he could not remove from his gloves. This is a wastewater pool from when Texaco was in the country. The company says it has cleaned up, but Donald tells me people like his family can’t drink the water. This is where the movement to protect Yasuní began. Communities affected by Texaco started a court case against Chevron – which is now the parent oil company. In other places in Amazonia, groups of people occupied oil platforms to protest against the effect on their communities. And in Quito, activists from the cities joined affected communities in the countryside. 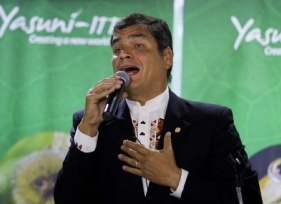 When Rafael Correa became president of Ecuador in 2007, there was an opportunity. The country had not supported presidents who preferred the interests of US companies to the interests of Ecuador. And so the new president had to show that he was different. He had to choose between the communities and the oil companies. He chose the communities. He ended the dumping of waste in the water pools. He visited affected areas – as he still sometimes does. He put his hands into the dirty ground and showed the TV cameras what needs to be cleaned. And, perhaps most important for the Yasuní, he made the environmental economist Alberto Acosta first Minister for Energy and then President of the Constituent Assembly, which recognized the rights of nature for the first time. 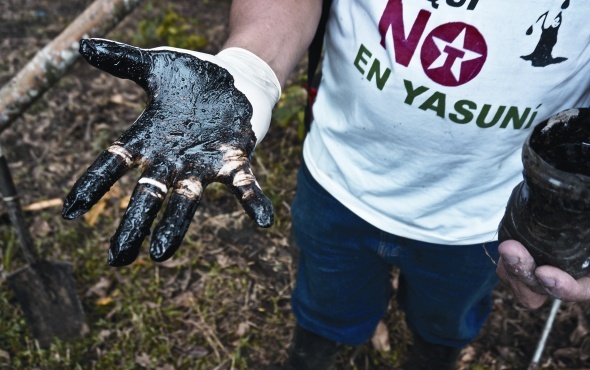 With this opportunity the Union of People Affected by Texaco joined with other groups including Pachamama and Acción Ecológica, to say that the government should not drill for oil in Yasuní. And so the Yasuní plan was born. For the next six years, the government told the world and the country about the biological importance of Yasuní. They had a plan to stop hundreds of millions of tonnes of CO2 emissions – if the international community paid. But it didn’t. Now things are very different. Why did the president change his ideas? In the early years, the government changed the oil contracts so that most of the money went to the country and not the companies. The money paid for anti-poverty schemes, free education and better transport. And there are oil deals with China. But at the same time without extra money, progress depends on oil and the systems of globalization. This is why the president who supported the environment, was against imperialism and debt feels they must drill for oil to sell to the US to pay foreign debt. After all of the wonderful speeches, some rainforest activists thought perhaps the government never really believed in the Yasuní plan. In a coffee shop in Quito, an activist explained that in meetings with groups the government said that the plan to save the rainforest and the plan to drill for oil should and would happen together. After some time, some activists thought perhaps the Yasuní plan was a way of keeping the activists quiet while the government prepared to drill for oil. Plans for a giant oil refinery began, and the work came closer to the borders of the ITT oil fields. Alberto Acosta left his job or perhaps he was pushed - different people have different stories about that. But the effect was the same - the supporters of the rainforest were left on their own. And so, after six years and changes to staff and plans, the president said that the Yasuni plan had failed. To continue his government’s progressive plans, drilling was necessary. He said the drilling would cover less than one per cent of the Yasuní National Park and that the drilling would be ‘eco-friendly’. I asked Donald if he thought the drilling would be eco-friendly. ‘It’s a lie,’ he said. Drilling has improved with the new government but there have been hundreds of oil spills. If they make mistakes in Nueva Loja, with all its infrastructure, what hope is there in far away Yasuní? For some people, especially the young who learnt about the project at school, the end of the project was the end of a dream. Now there is a new generation of environmental activists. In the days after the president’s announcement, a group met on the grass outside the offices of Acción Ecológica, and started a new movement – the Yasunidos. They only had a shed as an office but they decided to work together to collect the 600,000 signatures necessary to force a referendum on the problem. If it is successful, it will be the first time people in Ecuador have started a referendum. And it is possibly the first time in the world for a referendum to defend the rights of nature. But that isn’t their only problem. Some nonviolent activists say the police have followed them. Some are in prison. And Pachamama has been banned. The reason given was that some of the activists were violent. Activists think the government wanted to stop the movement trying to protect Yasuní. Once they worked together but the government now sees the people who do not want drilling for oil as enemies of progress. Activists say that the plans for drilling for oil are an example of seeing things in the short term. If the country wants to depend on oil, what will happen in 20 years’ time, when there is no more oil? They also say that the government has spent some of the money on plans that result in more cars, more CO2 emissions and more roads. Finally, they don’t agree when the government says it is showing some new kind of socialism. One activist said to me: You can’t fight for a new kind of socialism if you don’t fight to keep the oil in the earth. If we want to fight capitalism, we need first to fight oil. So now there are new activists collecting signatures on the street every day. They don’t have money and they are against the government and the big oil companies. But they do have the support of a young country with compulsory voting and a history of supporting progressive ideas. We often say that the future of the world is in the hands of the young people but in Ecuador the young want to prove this is true. This page was last edited on 18 April 2014, at 00:35. This page has been accessed 2,337 times.